Meet Surbhi, who studies 16 hours a day. She goes through every book under the sun relevant for UPSC but when the result comes her name is not in the list. Now meet Kanishka who believes in sharpening the axe before making the hit. She is organized, uses limited resources and spends lesser hours than Surbhi. Still she passes the exam with flying colors!!! What do you think made the DIFFERENCE???? Since childhood we have been reading the story of the thirsty crow which makes use of pebbles in order to make the water level rise. Do you think it was the right way??? Now consider the same crow making use of straw. Wouldn’t it help save time and take less effort!!! 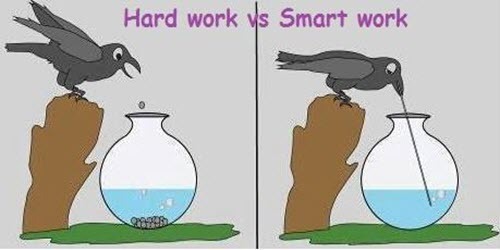 This is the difference between HARD and SMART work. Hard work means putting in a lot of time and effort doing a certain amount of work. 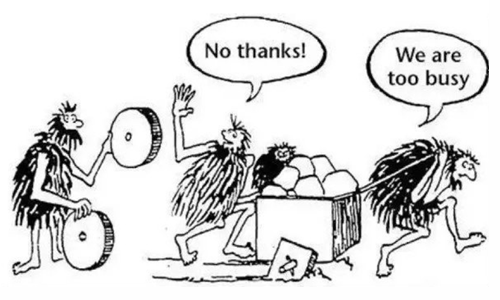 On the other hand, smart work means spending less amount of time performing the same amount of work. Hard work aims at the quantity and may become monotonous and boring after a certain period. Smart work aims at achieving goals with quality. Working hard involves a lot of tedious work which is carried out traditionally. But, if people work smartly, they can achieve more output by working in an unconventional and modern way. Hard work may help one to complete tasks but he/she may not be able to do so efficiently, and that’s where smart work comes into play. If one thinks that he/she needs to read HUNDREDS of books, attend IAS classroom coaching at MANY institutes for specialized classes for each subject, browse TENS of websites and prepare notes from FIVE newspapers and TEN magazines each day to clear IAS, THIS IS WRONG. The exaggerated actions are neither practical nor necessary to clear CSE. Even if an imaginary person does all what is stated above, there is still chance that he/she not clear Prelims/Mains. So what matters is not the quantity of materials one had gone through, but the quality of learning and revision done. Besides, aspirants should develop personalized strategies knowing their strengths and weaknesses, as general strategies might not work in individual cases. YOUR DREAM IS TO BE A “ DISTRICT COLLECTOR” NOT A “BOOK COLLECTOR”!!! Make a time bound schedule. Try reading selectively but read well i.e. mixing books and notes, making micro notes, in the shortest span of time is the right way to go about it. Make handwritten notes. Stick to the syllabus. Pick one subject and combine it with current affairs which should be covered for some time every day. Don’t try to multi-task. 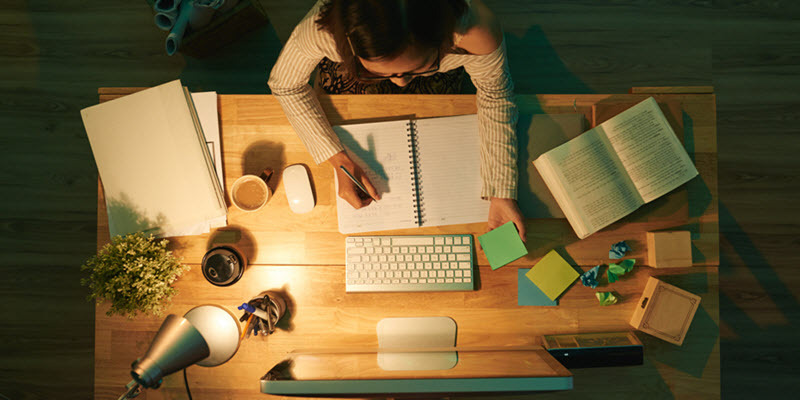 Instead of waiting till the last few days to take mock tests one should evaluate yourself right after completing a particular section in a topic. Leo Tolstoy writes in Anna Karenina “If you look for perfection, you’ll never be content.” The crux here is to be limit the sources. Managing time during the preparation is the ‘make it or break it’ aspect of CSE. One doesn’t need to become a scholar of the subject. UPSC only expects one to have the ‘General’ knowledge of everything, combined with a wise opinion and sound ability to express self. Revision is the most important part. One can go on acquiring new information. But not all of it stays back in mind. In order to not only remember the information but also to connect it with the stuff that one already knows, regular revision is required. If one feels anxious, worried or extremely tense, try to keep a diary to write down the feelings. It will make one process his thoughts better. Leaving everything one loves for the sake of studying is neither healthy nor feasible. One needs to incorporate the time given to studies with some personal time; this will prevent from getting burnt out in the middle of preparation and also help maintain a well-balanced personality. So, pursue a hobby. One needs to take plenty of sleep and take a healthy diet. Maintain a social circle. Laugh out loud. Don’t become a recluse. Exercise regularly. Although this exam demands discipline and perseverance it doesn’t want one to turn into a machine which only studies and suppresses all emotions. 14. Take a break and make those breaks happening but in a way that one gets back to preparation with double the zeal and enthusiasm. A person who is able to manage other spheres of his life efficiently without losing his disciplined routine is a suitable candidate for CSE. But is smart work alone enough?? Now consider this story. In a town named Stone Town, there were 3 friends Rahul, Amit and Narendra. Narendra and Rahul were hard working, but not smart enough. Amit (on the left side) was smart working maybe, not hard enough. Narendra and Rahul were best cart pullers of the town. They used to put huge efforts in pulling the cart, but still made around 5 rounds only in the day. That means lot of hard work but still low on results. On the contrary, Amit developed a smart way to pull the cart, but he was not working hard enough to get his idea implemented. When Amit showed Narendra and Rahul that this idea could increase up the productivity by making a new cart by himself. So he did the hard work smartly and built his own company named ‘Rolling Stone’ to ship stones. Amit approached Narendra and Rahul to join him and together they were able to make 10 rounds a day and sometime later Rolling Stone was the most profit making company of Stone Town. What we learn is that ‘Do Hard work to move up the ladder, however, you should keep the smartness in line with it, in order to move to the right place on the ladder’. HAPPY PREPARATION AND BEST OF LUCK !! !